Every now and then, I have a house guest from overseas. It might be a woodblock printmaker who wants to spend a few days watching my work, or perhaps one of the collectors who, during a vacation to Japan, stops by here to meet me, or maybe even one of my family members on a rare visit! I don't have very 'deluxe' accommodations to offer them, but that generally doesn't matter too much, as they are usually so excited by being in this exotic country that they don't mind a bit of hardship. I can't accept visitors too often, as it would be impossible to get any work done, but once in a while it offers me an interesting break from my benches. And it is always great fun walking around the neighbourhood with one of these guests, because it reminds me of what it was like when I myself was first in Japan, and everything was fresh, very new, and oh so strange! Those of you who have travelled overseas know what I mean; you walk down any street - even a quiet residential one where 'nothing happens' - and almost everything you see provides an interesting example of how the cultures differ. The first thing my visitors notice - this will be no surprise to anybody - is how close the houses are to each other. It is of course the American guests who feel this most strongly; it is difficult for them to imagine what it must be like to live in a neighbourhood that is so tightly squeezed together. I'm a bit curious though, what a guest from a place like Hong Kong might think about my Ome neighbourhood ... "What a wonderfully spacious community! ", is what he might say! Because these things, of course, are all relative. I should be careful though - after mentioning this first impression about houses being close together - not to leave you with the sense that my guests have negative feelings about the things they see. Far from it. They are all hugely impressed with the general appearance of this typical Japanese town. "It's all so clean!" "Everything is so wonderfully neat and well taken care of!" "I love these gardens ..." "Look! That lady is sweeping the street! ", are all common comments. But I have to tell you about one thing in particular that impresses the visitors, because I suspect local residents don't even notice it, let alone think that it is anything 'special'. 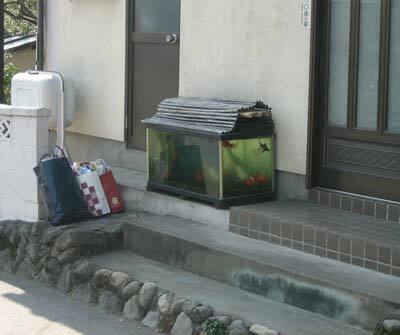 On the route between my house and the local supermarket, one of the homes has a fairly sizeable aquarium outside. It sits right out in the open, up against the road, and is completely unprotected. I think the fish inside are some kind of large goldfish (they are obviously not tropical fish!). Which is more important do you think? Having a community of huge homes and gardens, or having a community where a pair of goldfish can sit at their 'window' and watch us all go by on our way to the supermarket?